Artist Debby Miller’s oil paintings hang in the current Eddie Rhodes Gallery exhibit, “Look Homeward: Shades of Costco.” It focuses on the devaluation of symbols during an age of commercialism and will be up until March 4. Art provides individuals with a new perspective toward commonplace actions and symbolic figures in retail spaces. Currently in the Eddie Rhodes Gallery, the exhibit “Look Homeward: Shades of Costco” features oil paintings made by artist Debby Miller. The artist’s reception was held on Thursday from 4 to 6 p.m.
Art professor Dana Davis, who curates for the gallery, works as a photographer for Miller and invited her to display her pieces at the college. This particular show will be up until March 4. Davis said having Miller exhibit her work helps students think creatively about ordinary objects and spaces. When studying art, there are techniques and exercises students should practice and memorize. Miller has been working on this art series for the past two years. She said the techniques she learned give her freedom to portray what she wants in her artwork. 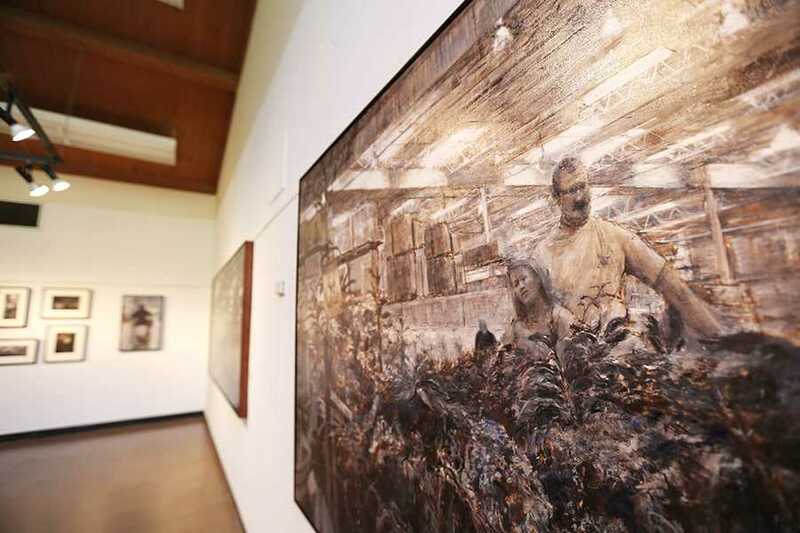 Davis said although practicing often may not be easy, seeing a huge set of paintings together like Miller’s exhibit may help students realize what they can accomplish. The centralized theme of the exhibit uses Costco as a familiar backdrop to depict the devaluation of symbols during an age of commercialism and reflect on the culture of materialistic fulfillment. While the paintings portray common sightings within the “big and complicated space,” Miller said the dark palette highlights the mercantile environment and adds value and depth to the composition. “Costco is a recognizable place, just a nuts-and-bolts space. (The limitation of color) makes it more for your imagination than of an actual setting,” she said. Upon entering the room, a painting opposite to the gallery’s door invites entering viewers with an elongated perspective of customers eating at Costco’s infamous red and white sitting area. Marin artist Janet Bogardus said this painting was one of her favorites because of Miller’s use of a deep red and bold white against a dark background. Miller said the paintings are reflective to the current economy. Costco is essential because “they have good prices and good products.” An individual can go there to buy their groceries, furniture and decor all in one place. Walnut Creek artist Marianne McCraney enjoyed a painting of a glimmering white chandelier hanging at the corner of a metal shelf with a blurred out price tag against a muddy background of a gridded ceiling. McCraney said the chandelier is reminiscent of its elegant depiction in earlier paintings by other historical artists. Monfield’s perspective regarding the wholesale store is now changed since viewing Miller’s artwork. Hours of the gallery vary by day: Monday through Thursday from 11:30 a.m. to 4 p.m., and Saturdays from 11 a.m. to 5 p.m.